David Hume was a philosopher who made major contributions to skepticism. In western philosophy, skepticism is, broadly speaking, the attitude of systematically doubting knowledge claims. However, skepticism actually encompasses a range of views and philosophies. Skeptics have challenged the adequacy or reliability of many speculative claims, such as the existence of God, by asking what principles they are based upon or what they actually establish. They have questioned whether some such claims really are, as alleged, indubitable or necessarily true, and they have challenged the purported rational grounds of accepted assumptions. In everyday life, practically everyone is skeptical about some knowledge claims; but philosophical skeptics have doubted the possibility of any knowledge beyond that of the contents of directly felt experience. The original Greek meaning of skeptikos was “an inquirer,” someone who was unsatisfied and still looking for truth. "[A skeptic is one] who doubts the validity of what claims to be knowledge in some particular department of inquiry; one who maintains a doubting attitude with reference to some particular question or statement. " "By exposing inadequate justifications for beliefs, the way is cleared for the seeker of truth to find adequate justifications. " "Being a skeptic doesn’t mean you are doubtful of everything, forever. It means you don’t accept claims as true without good reason. " In a way, epistemology is the counter part and opposite to skepticism. "Nothing can be known, not even this"
"...Pyrrhonian only withheld assent with regard to the non-evident propositions. " From ancient times onward skeptics have developed arguments to undermine the contentions of dogmatic philosophers, scientists, and theologians. The skeptical arguments and their employment against various forms of dogmatism have played an important role in shaping both the problems and the solutions offered in the course of Western philosophy. As ancient philosophy and science developed, doubts arose about various basic, widely accepted beliefs about the world. In ancient times, skeptics challenged the claims of Plato and Aristotle and their followers, as well as those of the Stoics. The French philosopher and mathematician René Descartes suggested that our senses could be mislead by an evil demon, which would throw all our knowledge into doubt. "[I] am finally compelled to admit that there is not one of my former beliefs about which a doubt may not properly be raised"
In the 17th century, skeptics attacked Cartesianism (the system established by René Descartes) along with other theories that attempted to justify the scientific revolution initiated by Copernicus, Kepler, and Galileo. David Hume is an influential skeptic who questioned religious belief that was supported by evidence. Later, a skeptical offensive was leveled against the Enlightenment philosopher Immanuel Kant and then against the philosophical idealist Georg Wilhelm Friedrich Hegel and his followers. Skepticism, especially since the Enlightenment, has come to mean disbelief — primarily disbelief in religious or paranormal claims that lack proper justification. It is easy to be skeptical about unfamiliar claims but to be a skeptic, in the philosophical sense, would be to apply it universally to knowledge and even to one's own beliefs. "The most ardent skeptics enjoy their skepticism as long as it does not encroach upon their own cherished beliefs. [...] It is easy, even fun to challenge others’ beliefs, when we are smug in the certainty of our own. But when ours are challenged, it takes great patience and ego strength to listen with an unjaundiced ear." Some studies suggest that belief is an unconscious processes, in contrast to disbelief which requires concious consideration which can override the unconscious believing processes. Based on this, skepticism more cognitively taxing than unquestioning belief. "The data suggest that readers must expend strategic effort to reject the information they acquire from literary narratives." "Analytic processing inhibits these intuitions, which in turn discourages religious belief"
Even if disbelief requires concious consideration, it does not necessarily make it a choice. Our conscious thinking is guided by criteria that are selected unconsciously. Nietzsche also observed that suspension of judgement is difficult and people jump to conclusions. He pointed out this may confer a survival advantage. "Whoever, for example, could not discern the "like" often enough with regard to food, and with regard to animals dangerous to him, whoever, therefore, deduced too slowly, or was too circumspect in his deductions, had smaller probability of survival than he who in all similar cases immediately divined the equality. [...] In itself every high degree of circumspection in conclusions, every sceptical inclination, is a great danger to life. No living being might have been preserved unless the contrary inclination — to affirm rather than suspend judgment, to mistake and fabricate rather than wait, to assent rather than deny, to decide rather than be in the right — had been cultivated with extraordinary assiduity. — The course of logical thought and reasoning in our modern brain corresponds to a process and struggle of impulses, which singly and in themselves are all very illogical and unjust; we experience usually only the result of the struggle, so rapidly and secretly does this primitive mechanism now operate in us." One example in which this effect may be observed is the tendency of people to imagining phenomena are caused by intelligent agents. Uncertainty, which is a possible outcome of skepticism, can be an uncomfortable experience. People are included to avoid this by choosing to believe a comfortable fiction. "The state of uncertainty is psychologically uncomfortable for humans and motives individuals to engage in actions and behaviors to reduce uncertainty, thus gaining predictability. " "Uncertainty is an uncomfortable position. But certainty is an absurd one." "First principle: any explanation is better than none. Because it is fundamentally just our desire to be rid of an unpleasant uncertainty, we are not very particular about how we get rid of it: the first interpretation that explains the unknown in familiar terms feels so good that one "accepts it as true."" Extreme skepticism is a niche philosophical position of adopting extreme doubt of all knowledge. Proponents fundamentally doubt the reliability of their senses, memory and cognition, which in turn implies the impossibility of belief in anything. This view tends towards perpetual indecision. Arguments for this view are the possibility of Descartes's evil genius or being a brain in a vat. Since it is impossible to maintain behaviour that is consistent with the view for very long, it is generally not considered a credible philosophical position and is rejected by most philosophers. Mainstream skeptics are willing to provisionally accept good evidence (Evidentialism) and, unlike extreme skeptics, do not insist on perfect evidence. "Whether your scepticism be as absolute and sincere as you pretend, we shall learn by and by, when the company breaks up: we shall then see, whether you go out at the door or the window; and whether you really doubt if your body has gravity, or can be injured by its fall; according to popular opinion, derived from our fallacious senses, and more fallacious experience. " The view can be traced back to the Greek school of Pyrrhonism. Extreme skepticism is similar to solipsism. Arguably, skeptical extremism is self-refuting  or at least self-undermining since it claims that knowledge is impossible. Some apologists make general statements that all skeptics are share this extreme view but this is usually a strawman argument. "A standard ploy, dating back to antiquity, is to argue that skepticism can be shown to be self-refuting by turning skeptical arguments back upon themselves (peritrope). How, it is ask, can rational arguments be used to undercut rationality itself without thereby undercutting themselves?" "Skepticism is itself a positive assertion about knowledge, and thus turned on itself cannot be held. If you are skeptical about everything, you would have to be skeptical of your own skepticism." This objection applies to extreme skepticism but not to skepticism in general. Skepticism raises doubts over the possibility of absolute certainty but it does not usually go as far as denying all rationality. Many skeptics allow that provisional knowledge is possible for "evident propositions" i.e. things that are readily observable. For this reason, the argument against skepticism is a straw man. 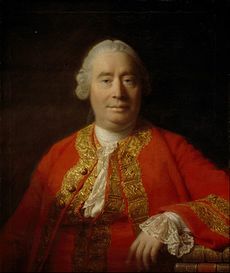 David Hume argued that having a high degree of confidence in rationality makes skeptical arguments appear stronger, while having a lower confidence in rationality makes the arguments appear weaker. For this reason, skepticism provides a useful counterbalance against over-confidence in rationality. "The sceptical and dogmatical reasons are of the same kind, though contrary in their operation and tendency; so that where the latter is strong, it has an enemy of equal force in the former to encounter; and as their forces were at first equal, they still continue so, as long as either of them subsists; nor does one of them lose any force in the contest, without taking as much from its antagonist. " As long as one is not a pure skeptic, it is quite possible to be skeptical about skepticism by doubting it and questioning it, but not necessarily rejecting it. Academic skepticism, which says "nothing can be known except this statement", sidesteps being self refuting by special pleading. Skepticism is not a productive policy when used by itself. To produce new knowledge, it requires additional philosophical tools such as empiricism and evidentialism. "You can get into a habit of thought in which you enjoy making fun of all those other people who don’t see things as clearly as you do. We have to guard carefully against it." "I simply walked out, frustrated with the entire semester. I could have respected a qualified "yes" or "no" with some reasons given, but not "I don't know"-I could get that from an uninformed man on the street. I expected a lot more from a university religion professor." This falsely equates considering the evidence and concluding "I don't know", with not looking at the evidence and saying "I don't know". Skeptical doubt on an issue is not the same being uninformed. "The simple believe anything, but the prudent give thought to their steps." ↑ 6.0 6.1 Why People Believe Weird Things: Pseudoscience, Superstition, and Other Confusions of Our Time by Michael Shermer, 1997, W. H. Freeman. This page was last modified on 1 April 2019, at 02:18.